First of all, is it an RV (recreational vehicle)? Motorhome (sounds fancy)? Coach (sounds expensive)? Rig (a fifth-wheel)? It's our home, so recreational vehicle doesn't feel right. 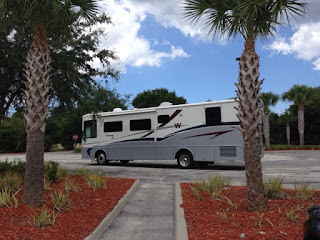 Technically, Class A's are motorhomes (which has the word "home" in it.) However, the DMV considers RV a legal term. I've been flip-flopping back and forth. Start your research online early to find out what is in your price range, what is available in your desired shopping area (and around the country), what are standard features, how long they are staying on the market before being sold, etc. Try to have realistic expectations going in. Initially, travel to an area where you can walk through as many as possible (for the boat it was Annapolis. For the RV, it was Florida.). It will help you learn your likes and dislikes. Look at smaller and larger that your desired length. Look at units over (and under) your price range to get ideas and understand the differences. (I didn't get The Colonel to walk through a Class B until the very end and it was too late to "turn the ship around." We already had a Class A we were interested in.) After day two of shopping, we had a checklist of likes/dislikes/things to check and the search was revised at the end of each day (and meeting several salesmen will help you decide who you want to do business with). Call ahead to confirm the RV's you are interested in are still in stock. Just like boat shopping, not all RV dealers keep their websites current. (Camping World Bartow does. Our RV was immediately changed to "pending"). When you get serious and especially when you are interested in specific models on the lot, avoid weekends. There are a lot of tire kickers on the weekend and the salesman (and boat brokers) may not take you seriously. Stand in the shower. Lay on the bed. Sit on the couch and look around. Root through all the cabinets. You'll be amazed what you'll see if you take your time. Like boat shopping with a broker, don't be bashful about having a salesmen walk with you so you can ask questions. We quickly learned to speak our mind. "Nope, I don't like the layout. What else have you got?" Or use key phrases to get your spouse to move on. "I was really hoping for an oven" (from me) or "It smells funny," (from him) means NEXT! (I ended up without an oven, but our home doesn't smell funny). Similar to boat shopping, our budget almost doubled as we discovered our minimum likes and dislikes. Be prepared for disappointment and to walk away. Don't be bashful about asking to have it powered up earlier instead of later (a/c not working in July is a deal breaker. Find out early before you get attached). Ask for the slides/awning to be run in & out (you definitely MUST do this before leaving a deposit, but asking early will reveal a salesman who is reluctant, not knowledgeable or not taking you seriously). If you are shopping in hurricane season in FL (JUNE/JULY!) shop early in the day. It quickly becomes unpleasant as the RV interiors heat up and even a good unit takes awhile to cool down. Our checklist. Everyone's will be different but some items we considered mandatory since it will be our full-time home part of the year. Other items were deal breakers. 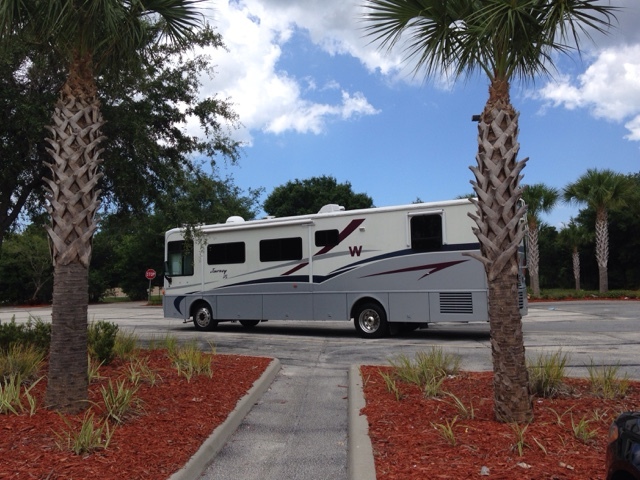 When you are trying to decide between two RV's, items like oven or convection and extra awnings can be tie breakers. Class A: Odin is a Class A (looks like a tour bus!). Class A's are criticized for being hard to drive (we learned the basics quickly and keep the days short but it's not for everyone) and using a lot of gas (see gas mileage below). We liked the idea of going back to grab a soda while rolling down the road (we used to say sandwich, but honestly, we just pull over and take a break when it's lunch time) and the cat being able to wander around the house without having to be put into a carrier. Tons of basement storage. Frankly, Odin the Winnebago feels bigger than our boat (and your living space also expands outside if weather permits) and the basement storage is nice. We are hoping to clean out a storage unit in MO (without increasing our gas mileage too much). Don't forget you'll be using truck stops instead of normal gas stations because of your height. 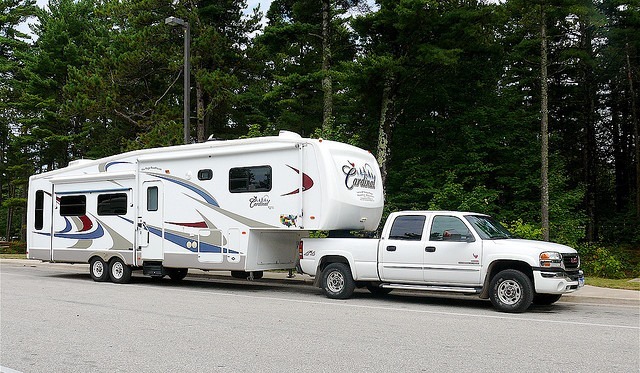 Fifth wheel: Fifth-wheels are distinct for the RV overlapping the truck bed. Several friends swear by their fifth wheels. They love the space and "not feeling like their car is in their living room." Many have multiple slides. Advantage is you have a second vehicle or toad/dinghy when you want to leave the rv park for groceries. Cons are: you need a good size diesel truck that can pull the weight. (Don't get stingy here). If you already have the truck and want to full-time, this is probably the way to go. Another con is putting the cat in a carrier to ride in the truck on hotter days, which is most of them for us right now. Also, we've been told that maneuvering in hilly campgrounds can result in the hitch dragging. Let's talk towing capacity. A Prevost pulling a pickup truck with a golf cart in the bed. The Colonel should really be writing this section but that's not going to happen. These are my notes as we learned the pros & cons. Any good info is his. Any typos or incorrect statements are mine. Handling: Another biggie we didn't know. Because diesels have the engine in the back, there is less noise and vibration in the cockpit, which results in less driver fatigue (and less wear & tear on the structure overall). I can't testify to the ride of a gas RV, but our diesel is very quiet up front while on the road. 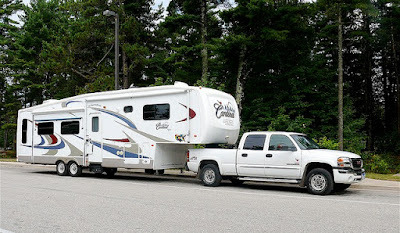 Turning radius: With the engine in the rear, the turning radius of the front wheels is usually increased to 55-60 degrees (increased turning radius GOOD when you're trying to turn your house around in that campground that looked good on paper). Air braking: Diesels have air brakes (like semis) that help when coming down large hills without overheating the brakes. We learned our air brakes quickly in the Smokies. 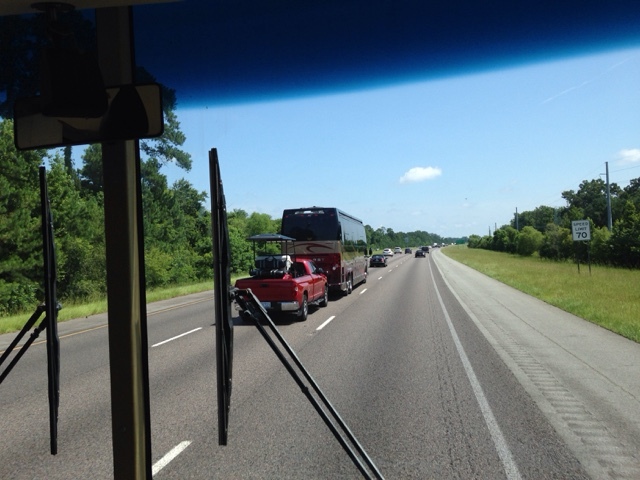 They would hold us at about 55 mph (depending on what gear you were in before they were applied). Easy peasy. Chassis: Gas will likely be a Ford chassis (used you may find a Chevy). Diesel is usually Freightliner, Road Master, Spartan which are basically the same as an over-the-road semi! Operating cost: The operating cost of a gas RV is less than diesel. Instead of going to a normal shop, you'll be going to a specialty diesel maintenance shop. There are more filters and oil is gallons instead of quarts. I mentally blocked out the cost of a set of tires for a diesel-pusher. See gas mileage above. Increased living area: The diesel manufacturer's claim that since the entry door in front of the passenger seat (instead of behind in a gas) you have increased living area. This is a weak excuse to me, but may affect your interior layout preferences. So the moral of the story is, decide what's right for you (and in your price range). Whew! That felt like a book report!